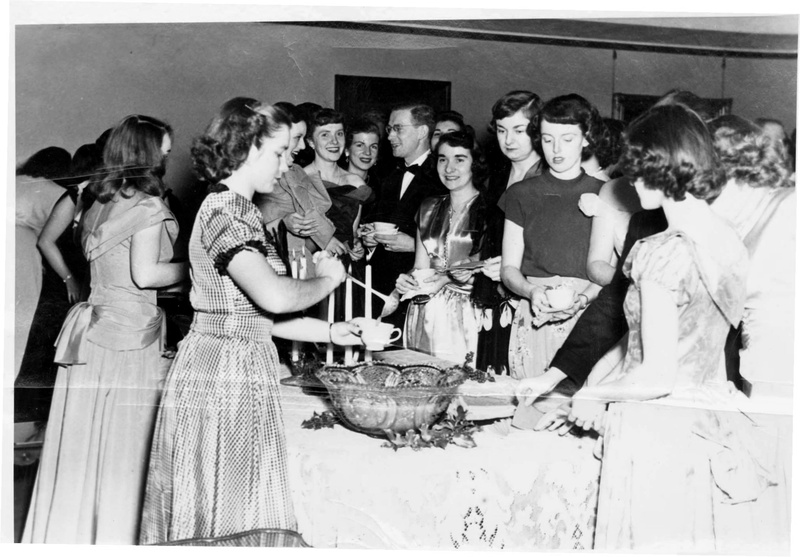 A group of students and their dates enjoy the wassailing cocktail party. Photo from SHU Archives. One of Seton Hill’s most loved traditions is about to return for another year. With Christmas on the Hill on the horizon, it is time to dive into the history of this beloved tradition. The first iteration of Christmas on the Hill happened in the 1890s during the university’s time as an all girl school. There was a terrible snowstorm that prevented many of the ladies at the school from leaving for Christmas. Due to this, the Sisters of Charity stepped in and asked the students to join them in a Christmas dinner. There was no dance, no fancy decorations and no Santa Claus, but the young women had such a wonderful time that Christmas dinner with the Sisters became tradition. Over the years the dinner has evolved. Originally the Sisters served the meal, then in the 1920s the sophomore class began serving instead. This was done to give back to the older women who had shown them around campus and helped them when they needed it. The 1980s marked the end of the sophomore class serving Christmas dinner. From this point on, the dinner was served by faculty and staff. The dinner was not the only part of Christmas on the Hill that has changed over the years. In years past, wassailing, an early form of caroling, took place before the dinner. Wassailing also took place afterwards but more so in the form of a cocktail party where the students would drink wassail and enjoy some entertainment provided by jesters. This entertainment gave way to an actual dance beginning in the 1950s. And for the first time since the 1950s, there will be a wassailing ceremony held in the Greensburg Room at 3:45 p.m. on Dec. 3. Nowadays, SHU still hosts two dinners, with an appearance from Santa Claus at both, a mass and a dance for all students to enjoy. 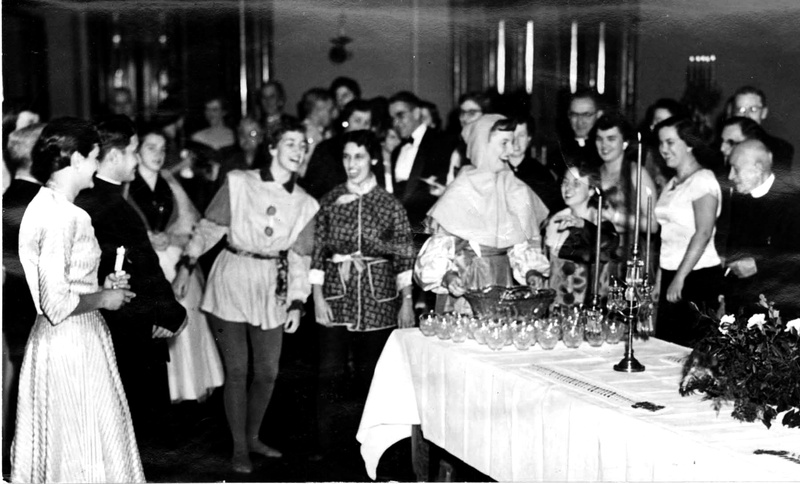 Before SHU held a Christmas dance, students were entertained by jesters after dinner. Photo from SHU Archives. Smoulder is not the only one who enjoys the decorations of the dinning hall, as senior art therapy major Kaitlyn Wessel agreed. “I love the atmosphere the dining hall has with all the decorations and the candle light,” Wessel said. It is not just the students who enjoy Christmas on the Hill, but faculty as well. In years past, communication professor Jen Jones has helped to serve dinner. Christmas on the Hill truly brings out the best of the SHU community and the Christmas spirit.